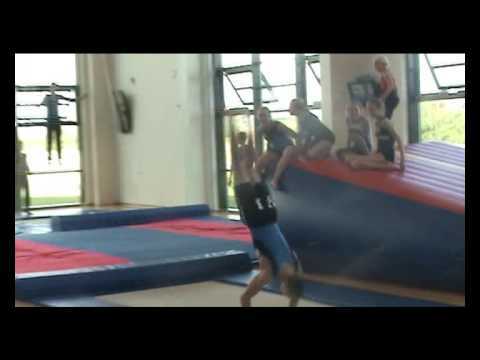 Offered as an extra-curricular activity in association with Vedersø Idrætsefterskole, you will obtain the experience of acquiring new skills, through personal and group involvement within spring gymnastics, parkour and tumbling. The content includes warm up to music, training of basic spring and more advanced spring dependent on your level and the level of the group in question. School’s facilities include a Gymnastic Hall and Spring Centre, where 3 pits, 15 metre HGB fibre track, 15 metre Air-Track Pro, 5 large trampoline beds, Pegasus, Dorado, MD- and PE mini-trampolines, 3 soft mats and all sorts of equipment, which is always at the ready for lessons and free time, make this a mecca for tumbling and Team Gym. Please note that this elective is taught in Danish together with students from Vedersø Idrætsefterskole. Instruction will be given in English when/if necessary.